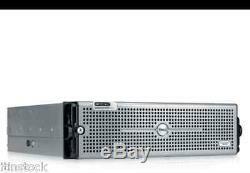 Dell PowerVault MD1000 10 x 146GB SAS 15K Drives 15 Bay Storage Array Network. In good condition and in full working order. 15 x 146Gb SAS 15k hot plug drives. 1 x Set of rails. Supports up to 15 x 3.5" SAS hot-plug 3.0Gbps hard drives, at speeds of 10,000 and 15,000 RPM or 15 x 3.5" SATA II hot-plug 3.0Gbps hard drives, at speeds of 7,200 RPM. Dual Power Supplies - 478W (Maximum continuous); 550W (Peak). Dell PowerVault MD1000 Storage Array. The Dell PowerVault MD1000 expansion enclosure is optimized to support high-capacity applications and its modular design enables easy expansion and pay-as-you-grow flexibility. It can be used in conjunction with a server-based Dell PERC RAID controller and can accommodate up to fifteen 3.5 disk drives in a single 3U rackable chassis. This direct-attached storage enclosure supports both Serial Attached SCSI (SAS) and Serial ATA (SATA) disk drives to offer extensive configuration and optimization flexibility. Dual power supplies allow for redundancy. VAT IS NOT PAYABLE BY PURCHASERS OUTSIDE THE European Union (EU) AND by purchasers in the EU (excluding UK) who are VAT registered. The item "Dell PowerVault MD1000 15 x 146GB SAS 15K Drives 15 Bay Storage Array Network" is in sale since Wednesday, February 21, 2018. This item is in the category "Computers/Tablets & Networking\Enterprise Networking, Servers\Servers, Clients & Terminals\Computer Servers". The seller is "itinstock" and is located in North London. This item can be shipped worldwide.